If you were given the chance to rummage through the dumpster of your favorite beauty store and get your favorite makeup products for free- would you take it? There are actually many people who go to stores after hours and search through the dumpster to see what products they can score for free. Makeup, clothes, electronics etc. Mind you, most of these people who do this are financially stable and their justification for doing this is that if they can get a product that works properly, is unwanted and is free then it's fine. I think it's sort of the same feeling as when someone finds a product they really like that's on sale for a really cheap price. It's like a sort of rush that they feel. I know it may not be the same feeling but that's what it reminds me of. Note; that this post will not be about dumpster diving for food or other necessary things for life because that's a whole different discussion and if someone has to search in the garbage for their next meal that is something that no one should look down on. However, there are a lot of ladies who go to their favorite beauty stores and they look through the dumpster and find a ton of make-up products. Most of which are testers and have already been used. 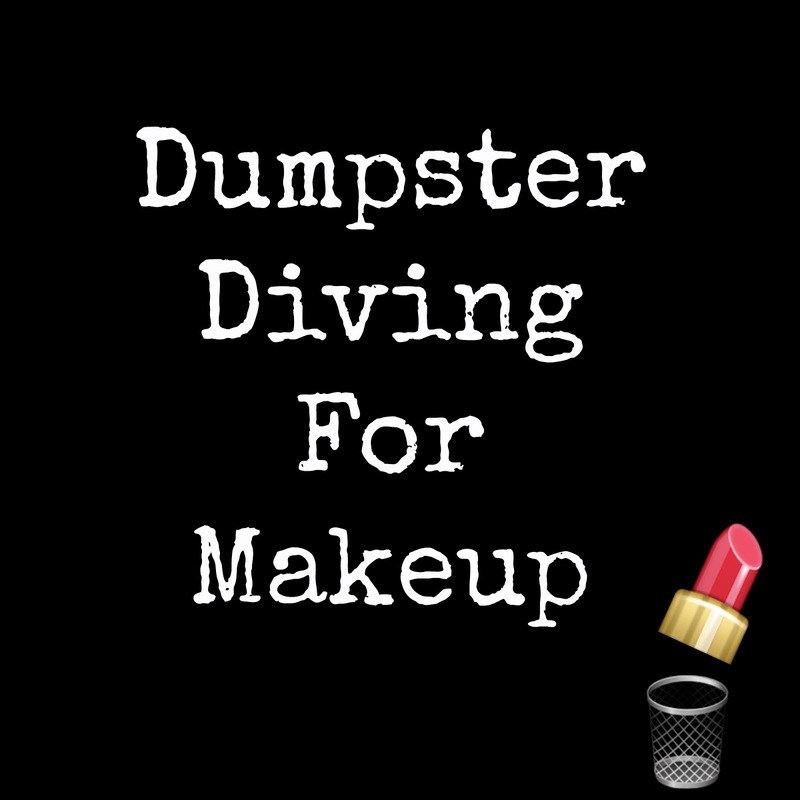 If you would like to know more just go to youtube and search dumpster diving for makeup and you'll see loads of videos of women sharing what they got while dumpster diving. One video that stood out to me was one where a lady went to a sephora dumpster and most of the products that she got were testers that were halfway used. She was so excited to have found these products for free and she claimed that she disinfected everything but I really wondered if it's still safe to use them. In the video the lady shows a liquid eye makeup remover that was about 1/3 of the way used and I shuddered at the thought of her using it, it's definitely not possible to sanitize liquid makeup, mascaras, lipglosses. Sure, you can sanitize the applicator but that doesn't mean that the product itself is sanitized as well. Moreover, you just don't know where that makeup has been. We all know better to share our makeup with our friends but how are they ok with using products that have been used by tons of people. It is foolish to assume that these products are just being swatched on the back on their hands. I believe that it isn't worth it to risk your health just to have high end makeup- it isn't a necessity. We are always warned about the risk of getting eye infections when using someone else's mascara or eyeliner and using makeup testers are no different. There are other risks as well such as herpes and more. It is no secret that high end makeup makes us feel a little more glam and special even if we aren't aware of it but it isn't smart to risk your health for a fleeting moment of happiness. In our modern world good health right now is a luxury that not everyone can afford. 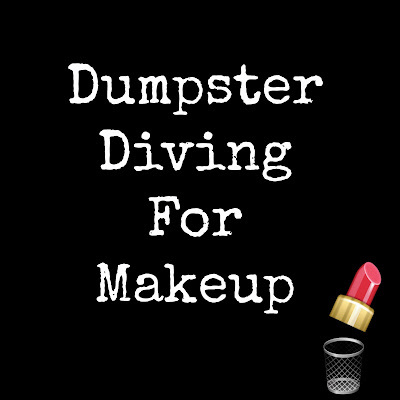 I would love to know your thoughts about this and if you ladies have ever dumpster dived for makeup please share your experiences. Yin Yang Nails! I love the way this turned out and I have received so many compliments from people. I was tired of just doing regular nail colors so I wanted some change. I decided to try yin yang nails for the first time and change my nail shape. I was so tired of my nails I felt like I wanted a drastic change and it does feel like a change because I have had square nails for years. Lately Ive been seeing that pointed and oval shaped nails are very trendy now and I wanted to give it a try. It's a refreshing change but I miss my square nails and I think ill be going back to that. I painted my nails white with Milani's high speed fast dry nail polish in White on the Spot. Then I used L.A Colors Art Deco nail art lacquer in black (you can use any nail art polish with a thin brush) and created a S-shape on the nail. It is easier if you take your time with it- if you try to draw it in one shot then the shape wont look right. After that I used Wet n Wild's Fast dry nail color in Ebony Hates Chris to fill in the black side. After that dried I took the round ends of a hairpin and dipped them in white and black to create the dots. Voila! That's it! You can apply a top coat if you like but I didn't. I'm excited to share my thoughts on this foundation as it is my first MAC foundation. I purchased it last minute because I went to the MAC store looking to buy Face & Body but the MUA said I would be better off with this foundation instead. She told me that F&B would be too sheer for me and this foundation would be able to cover up my acne scars while still giving me a dewy look that I desired. "A combination of powders creates an optical blurring effect that virtually diminishes imperfections and fine lines, for a more even tone. The light-reflecting, natural satin finish makes skin appear refined, revitalized and refreshed with a new purity, softly lit from within. SPF 15 adds the perfect finishing touch of sun protection. Features our 77-Mineral Complex, Shea Butter and Vitamin E."
It costs $34 and it contains 1 US Fl oz of product. It comes in a sturdy frosted glass packaging with a plastic pump. The coverage is light to medium and it is buildable without looking cakey. That is one of the things that I love the most about this foundation that it feels very lightweight and looks natural. HERE is a FOTD post where I have this foundation on. It is long lasting- I have worn it the entire day without my foundation fading or my acne scars peeking through.You HAVE to set it with powder because once you apply it, it feels kind of sticky on the face as if it hasn't set. This foundation seems to never set so you really need to set it with powder. I feel that it is best to apply this foundation with your hands or a makeup brush, such as a stippling brush. I have tried it with a sponge but I have to use more than two pumps for my entire face with it and it becomes time consuming to have to build it up. This foundation blends effectively with my fingers and brush and gives great coverage. I have combination skin that gets very oily in my T-zone area. I love the look of dewy foundations but sometimes it makes me feel like I look really oily. Mineralize Moisture does not give me this problem. It gives a lovely glow without looking my face looking like an oil slick. I think that ladies who oily skin who want to try a foundation that will give them a lovely dewy look will love this foundation. In addition, I strongly believe that ladies with dry skin will LOVE this foundation as well! It feels very hydrating on the skin so I'm sure that those with dry skin will love this foundation. UPDATE: Unfortuntely, this foundation breaks me out so I cant use it anymore. I'm going to Back2Mac it. The Unsung Heroes series is dedicated to products that are amazing yet are not very well-known. The first post of this series is dedicated to my new love, MAC Prep + Prime Lip. When I entered MAC I did not have the intention of buying this but when I was swatching all of the matte lippies (I have an obsession with matte lipsticks) the MUA suggested I try it on. I tried it on and applied Ruby Woo over it. I noticed that it left my lips moisturized, the color stayed on my lips for a long time and it did not feather. That is when I realized I really needed this product in my life! Prep + Prime Lip is a clear lip balm that when applied will ensure that your lips are smoothed, moisturized and your lip color will last longer on your lips. It costs $16 and contains 1.7 grams of product. It has a vanilla scent that I love! MAC Prep + Prime Lip is a basic lip product that should be in every woman's makeup bag. Basically, you apply it on your lips as it were a lip balm and you let it sit on your lips for about a minute until it feels sort of tacky on your lips. It feels as if you applied a glue stick on your lips (its weird, I know) This will ensure that your lip color will adhere and stay on longer and it smooths the lips. When you first apply it on your lips it feels very slippery, its like the same texture when you apply a primer that contains silicone then it gets tacky on the lips. Prep + Prime Lip has become my HG because it lets me wear matte lipsticks without having to worry about it drying my lips and it helps my lip color stay on longer even through eating and drinking. It's great for both matte and other lipsticks. Even if you don't own any matte lipsticks this will still be great for you because it will help your lipstick stay on longer. As I stated before, I love matte lipsticks but sadly my lips are dry so I cant wear them for more than a few hours at a time before I have to remove it and apply them all over again but it doesn't look good because I'm left with dry patches. This product definitely solves all of those issues. If you ladies love matte lipsticks but feel like you cant rock them because they are too drying then I highly suggest you try Prep + Prime Lip. I received this nail polish in my Surf's Up VoxBox from Influenster. Surf's Up VoxBox is summer themed and I find that this nail polish shade is definitely appropriate for summer. When I saw this polish in my box I was very excited to try it on as I don't own a color like this. It is a pretty pastel green with no shimmer or glitter. It is a creme nail polish.The formula is very thick- it makes it a little difficult to apply. It is very opaque so that is a plus. The directions say to apply two coats. I understand why it says to apply two coats because I found when I applied one coat it was opaque enough to just have one coat but it can be a little streaky but you can get away with one coat. One thing I did not like about this polish is that you really have to ensure that your nails are buffed and definitely apply a base coat before you apply this polish. Song of Summer is a very gorgeous color and I don't have any thing like it in my collection. It definitely does not chip easily. I have had it on my nails for 6 days with very minimal chipping at the tips. What I love the most about this polish is the color and the least is the formula but its not that bad. You can find Sinful Colors nail polishes at Walgreens for $2 and occasionally Walgreens holds sales so you can get them for $1 each. Disclaimer: I received these products complimentary from Influenster for testing purposes. All thoughts and opinions are my own. When a product promises to you give you beautiful beachy wavy hair- you instantly become interested right? I did. I received this product in my influenster surf's up voxbox. It is sulfate free and suitable for all hair types. It promises to detangle, hydrate, and give you that beachy wavey look. Although it is sulfate free it still lathers and it did leave my hair feeling clean. I felt like I was cheating because I am going "No Poo"- I am using a shampoo bar but I wanted to give this a try. This shampoo and conditioner has a lovely coconut smell and I love the smell of coconuts so I think that made me automatically love this product. This scent lingered for a couple days so that was awesome. I do feel like it is hydrating but for good measure I applied a little bit of coconut oil on my ends. This is what my hair looked like after I used it. I have curly-wavy hair but I think that it made my hair slightly wavier. I love the shampoo and conditioner's smell but I think that it is average- nothing to write home about. I think it is worth a try if you like the beachy hair look and like sulfate free hair products but I find that it is an average shampoo and conditioner. Have you tried Not Your Mother's hair products? At least I feel like they should be. I received my first voxbox from Influenster last week and I am so excited to share with you all what I received. First things first, Influenster is a website where users share their reviews and experiences with products and Influenster periodically releases their famous "Voxboxes" to users. What is a VoxBox? Basically, it is a box filled with complimentary products and you test them out and review the products on the website. Influenster makes things fun by having challenges, contests and etc that you complete on social media. The Surf's Up VoxBox's theme is summer related. Influenster emailed everyone telling them that one of the products in the VoxBox may be the new Covergirl Bombshell volume mascara. I didn't receive it and I felt kind of disappointed because I was totally looking forward to trying it. My best friend received it though- she likes it but she says it is difficult to wash off. Not Your Mother's Beach Babe Texturizing Shampoo & Conditioner: It is sulfate-free and suitable for all hair types. It promises to detangle, hydrate and give wavy volume. My next post will be a review/ first impression of this product. First Aid Shot Therapy: It is basically a liquid pain reliever. It contains choline salicylate & caffeine pain reliever/fever reducer (NSAID) pain reliever aid. It is FDA compliant and is berry flavored. I haven't used it yet. Sinful Colors "Song of Summer" Nail Polish: I love nail polish so as soon I as I saw this I grabbed it and applied it. It's definitely a summer appropriate color and I will have a review post coming up soon. Hawaiian Tropic Silk Hydration After Sun lotion: Perfect for summer! It contains aloe vera so its soothing for the skin after a long day in the sun. I feel like its very hydrating and it has a pleasant coconut-papaya scent. It has a fruity-coconut scent to it. I like it and I think I would purchase the full size. Jamba Juice: My VoxBox also included coupons for a free Jamba All Natural Smoothie Kit and $1 off any one 8oz Jamba Frozen Smoothie kit. I have not used this yet. I will post reviews about the shampoo & conditioner, jamba juice and nail polish soon. I will post my review about first aid shot therapy in this post as an update. If you are interested in joining influenster then I totally recommend you do, you will love it!